Tres Alamos Ranch - Headquarters West Ltd. The Tres Alamos Ranch is located 7 miles north of Benson, Arizona. Benson is a short 40 mile drive east of Tucson. The ranch is accessed via the Ocotillo Road Exit on I-10 then traveling north on Ocotillo Road. The property has paved access to the front gate. The ranch is located in the beautiful San Pedro River Valley. This scenic area is drained by the San Pedro River which has many areas of perennial river flow, shallow groundwater and is noted for its lush riparian areas with abundant wildlife and birds. The eastern border of the property is bounded by the San Pedro River. This valley has a very mild climate and scenic views in every direction. The Tres Alamos Ranch consists of approximately 668 acres of private land. The ranch has historically been used as a combination livestock/farming operation. 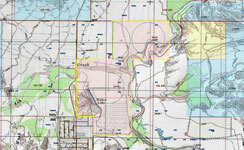 The property is divided into irrigated lands, grazing lands, and a thirty acre Pine Tree grove. The present owners have grazed up to 300 head of cattle on the ranch. 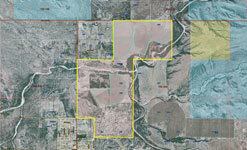 The property has approximately 190 acres of currently irrigated land with more available for development. There are three separate center pivots supplied by three irrigation wells. The pivots have all been installed within the last seven years. These fields have been previously planted with grazing pasture to support livestock but could be planted in other crops as needed. There are four irrigation wells currently in use with depths ranging from 105 to 195 feet and static water levels of approximately 40 feet. All of these wells are powered by electric pumps. There are two additional irrigation wells and two artesian wells that are not currently in use. There is a domestic well that supplies the house and is serviced by electric power with a submersible pump. The ranch has a small two bedroom, two bath home in current use by the owners. There are two other homes on the property that require some repair. The structures are all constructed of burnt adobe masonry construction with stucco exteriors and are approximately fifty years old. The ranch has a large set of steel corrals with metal shades and concrete feed bunks that will comfortably handle a large number of cattle. Adjacent to the corrals are two approximately 2,400 square foot fully enclosed steel barns or shops. The ranch has electric and telephone service. Water is provided by private well. Sewer is by septic tank and propane is delivered by local providers. There is an approximately thirty acre Pine Tree grove that was planted a number of years ago and could be harvested for lumber. Approximately 112 acres of the southern portion of the ranch has been subdivided into residential lots. This area has historically been used for grazing purposes but could be developed into additional irrigated land or the lots sold for investment purposes. The Tres Alamos Ranch is a very desirable property that has easy access to I-10 and Tucson yet is very secluded. The property has a number of different potential uses and lends itself to continued agricultural production with a quiet rural lifestyle. Rarely does a property of this caliber come on the market.